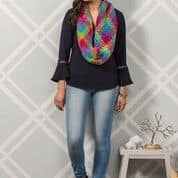 Have you tried planned pooling yet? I know how that went. You saw those colorful plaid designs and decided to try it out. You grabbed some variegated yarn from your stash and got started. That’s how you found out it takes a lot of skill to recreate the designs. 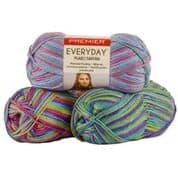 Enter the new color pooling yarn … Premier Yarns Everyday Plaid yarn is made to create those gorgeous plaids you crave. 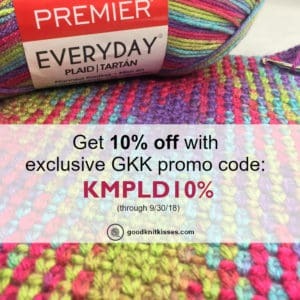 I had the opportunity to chat with Rae Blackledge from Premier during my weekly GoodKnit Kisses Facebook Live broadcast (Mondays 9 a.m. Central). 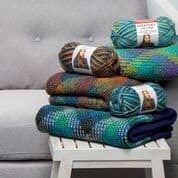 We had a great time talking about Everyday Plaid and why color pooling really is easier when you have the right kind of yarn. You can see the full interview below. What makes Everyday Plaid unique is the consistent color changes. As you may have noticed trying other variegated yarns the colors don’t always change at specific lengths or in the same order. This makes color pooling inconsistent at best. By crafting a yarn with colors the change consistently you can use any of these colorways to make a beautiful plaid. These are just a few of the amazing patterns they have available from Premier. More plaid patterns are in the works so it’s worth it to follow Premier just to get those updates. 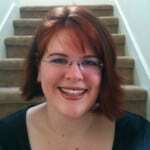 Watch my full interview with Rae Blackledge from Premier as we chat about Everyday Plaid yarn! 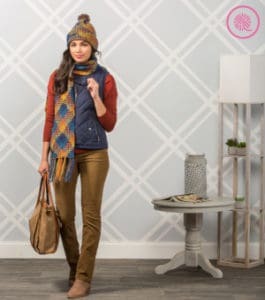 Be sure to tag me on social media with #goodknitkisses so I can see your plaid pooling creations! Have you used this yarn on a knitting loom at all? Just wondering. I just bought a few skeins recently. Trying to decide what to make, lol. I have been trying to get the effect using Premier Plaid color pooling yarn. They have a pattern that is called Loch Ness Poncho. Seems pretty straight forward; but I have tried it about 10 times now, and get a different effect every time! Any suggestions, feedback?